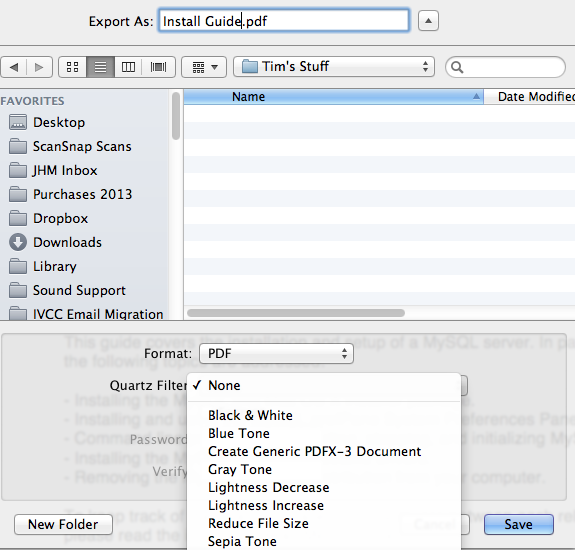 From the pop-up list next to Quartz Filter, select Reduce File Size. Use the image below as a guide. The file size reduction is primarily achieved by reducing the quality of images in the PDF file. Please review the resulting file to make sure the image quality is satisfactory. It turns out that one can make their own custom “Reduce File Size” filters to control the amount of image quality reduction. This helpful tutorial explains how and also indicates subtle changes that apply to older and newer versions of Mac OS X. If your PDF file is still not small enough to send as an email attachment or if you have a handful of PDFs, which collectively are too large to send as attachments, then you should consider using DropBox. I have a tech tip about using DropBox this way. Read more about Apple, file size, PDF, Preview, reduce.